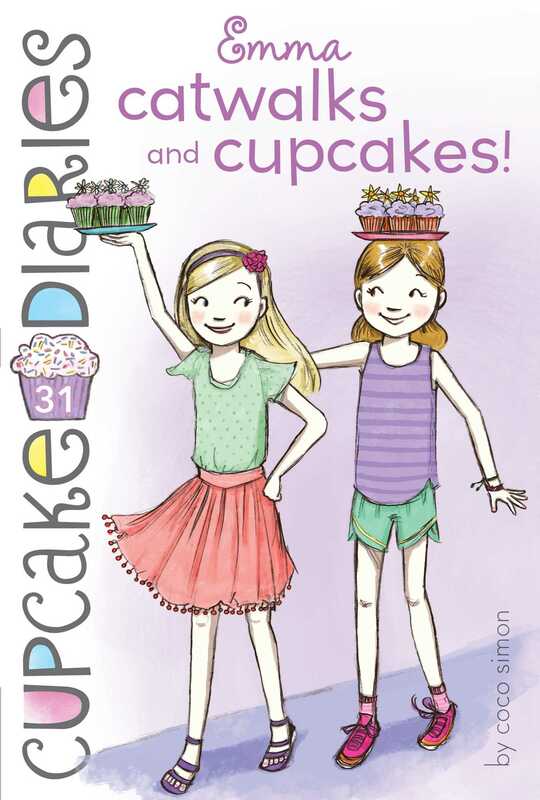 Emma loses a modeling assignment—to Katie!—in the latest addition to the Cupcake Diaries series. When Emma goes on an audition for a new modeling job, Katie tags along to keep her company. But as it turns out, everyone wants Katie to model instead of Emma! At first Emma is happy for her friend. Soon though, she realizes sharing the spotlight isn’t much fun, even if it is with your BFF! Will the Cupcake girls continue to bicker amongst themselves or will they finally realize there’s just one person you need to please—yourself? Yay! It’s summer! And bummer! It’s summer! I thought as my alarm chimed this morning at six thirty. It’s always fun when the seasons change and I have a break from the regular school schedule, but summer also means more work for me. It still feels weird to say it, but it’s really true: I’m a model. Yup, me—good old Emma Taylor. What started out as a small, occasional job at our local bridal store turned into a pretty good moneymaker for me and my family, so during the past year, I’ve gotten together a portfolio of professional photos of me in all different looks and styles (hair up, hair down, happy, dreamy, silly—you name it), and now I send out my one-sheet (usually an e-mail—with a few of my best photos, and my statistics: height, weight, hair and eye colors, skills, and contact information) and go on go-sees, which are like tryouts for models. During the school year, I fit my modeling around my real life: school and sports and my best friends—Alexis Becker, Katie Brown, and Mia Vélaz-Cruz, plus our cupcake baking business, the Cupcake Club. But now that school was out for the summer, I’d be using all my free time to land modeling jobs and go on shoots. My parents let me make all the decisions about it. Any job that I’m offered is mine to accept or decline. They think modeling is kind of weird, but they also like how the money I earn fattens my college fund. My mom had reluctantly fallen into the role of manager for my career (in addition to her job at the library), while my dad and sometimes my older brother, Sam, take me to jobs both near and far away. Today was my first real day of summer vacation (yay! ), but I had to head into the city for a go-see. My besties would be hanging out without me (bummer! ), and I would not have a moment to relax. The day started with an early alarm. Then I had to shower, clean my skin really well, double wash and condition my hair, take my vitamins, moisturize, and dry my straight blond hair perfectly, with just a little bit of a flip at the ends. I do not usually wear makeup, but sometimes I use a lip shine and maybe a little bit of gel to hold my eyebrows in place. My mom is really uptight about me getting too into my looks, so she always checks my face to make sure I’m not wearing makeup. She thinks it’s unhealthy for kids to have too many chemicals on their bodies (everything she buys for me to use is organic), and she also thinks I’m too young to wear makeup every day. After I was all squeaky clean and fresh, I picked out my outfit according to what the memo was on the job I was going for. Today they were looking for girls for a winter coat ad (yes, it is June), and they wanted a wholesome and fresh look. Wholesome and fresh is my specialty! So I chose a plain, pale pink polo shirt; a new pair of dark blue jeans I’d been saving for a special occasion; and a pair of unscuffed pink sneakers with small white ped socks. I put a little pink clip in my hair to the side. Downstairs, my mom was getting breakfast ready. She had the day off from the library, so she had time to drive me into the city. “Hi, honey,” she said. “And happy first day of summer!” She turned from the stove with a plate of scrambled eggs and buttered toast for me, plus a glass of my favorite juice: nectarine! Everything looked delicious. “Thanks, Mama,” I said, calling her my private, babyish name for her. “Well, I like everything I do. I mean, I wouldn’t do it if I didn’t like it.” I shrugged and then dug into my breakfast. As I was chewing, my phone pinged and I checked it. It was a text from Katie. What’s up, sister? Big plans for today? Let’s celebrate summer together! I sighed and put the phone down. Then I took another bite of toast and looked out the window. It was going to be a gorgeous June day. The perfect day to go to the lake, or to the town pool, or even to the mall with my friends. I felt a tiny bit sorry for myself for a second, but then I shook my head to clear it. Booking this go-see was my choice, and if I got this job, I’d make a really good amount of money from it, like a quarter of a year’s college tuition. My mom was watching me, though. “What’s the text?” she asked lightly. I could tell she didn’t want to pry, but my facial expression must’ve given away my feelings. I sighed. “Thanks, Mama!” My fingers flew over my phone’s keyboard as I texted Katie back. I put the phone down, crossed my fingers and waved them at my mom, and then finished eating. My phone pinged again, and I checked it. Awesome! I’m in! What time should I be ready? “Yahoo!” I cheered. My mom and I organized the details, and soon we were off. At Katie’s, she was standing outside on the sidewalk waiting for us. I laughed. “I guess I kind of am a real model now,” I said. I sized up Katie’s bedhead and ripped jeans. She had on purple flip-flops and one of our old promotional cupcake T-shirts that was stained with what may have been strawberry extract. Katie is naturally pretty, with wavy brown hair and friendly brown eyes. Her skin is fair, and she has a cute smattering of freckles across the bridge of her nose. If I were casting the role of “best friend” in a television show, I would pick her. Her fashion sense isn’t the greatest, but she has other passions, and that’s why I love her! I had to laugh. It was true what she said. She was always a bit messy, and I am pretty careful when it comes to my clothes. I’m not prissy, but I take care of my things—probably because I know that it’s hard to earn the money to pay for stuff, and also because I do need to look good to get jobs. “Not around cupcakes, though!” I laughed. “Wow, good for her!” said my mom. Alexis is super career-minded. She’s probably my actual best friend, because we’ve been close since we were toddlers, and our families are good friends. Katie and Mia are newer friends, and even though we’re superclose, it’s not like it is with Alexis and me. We can just read each other’s minds. Sometimes that can be annoying, but mostly it’s great. “Yup. She says she wants to get a crash course in the food service industry, so she can decide if that’s the area she wants to work in when she grows up. And Mia is taking a fashion design course at the community college and visiting fashion companies in the city for one day every other week,” I said. “Wonderful! And, Katie, sweetheart, what are you doing this summer?” she asked. “Me? Oh. Not much. A cooking class at the high school for three weeks, then maybe day camp?” She winced. Day camp is a little babyish in theory, although the camp we all went to last year was awesome. It’s just that the rest of us aren’t going this summer. Thinking about my friends’ summers, I had mixed feelings. I had to say I envied Alexis her very summery job. She would be at the pool and outdoors a lot. There would be tons of kids around all day, and maybe some cute boys. She was working in an industry that interested her. It was all good. Mia was following her dream of becoming a fashion designer. And Katie . . . Well, Katie was keeping it casual, which was also cool. I’d be pretty busy, working a lot, in and out of the city. It was hard and a little lonely, and definitely not that summery! I had to giggle at the look on her face. “Yeah. Crazy, right?” I shrugged. Soon, we reached the city, and my mom dropped us off outside the studio building. I knew the drill, so I wasn’t nervous to go on my own without her. “Thanks. No problem,” I agreed. I gathered my portfolio and took one last peek in the side mirror, and then we headed in. This is the part where I always start to get a little anxious. Katie and I got into the elevator with two other girls and their moms. The moms smiled stiffly at me (I guess we’re all in competition), but the girls didn’t smile at all. They just flicked their eyes up and down over me and Katie, quickly sizing us up. When the elevator doors opened with a ping, Katie and I followed the quick-stepping moms and their little models to a central desk in a massive waiting area. I kept my eyes trained on the receptionist because if I start looking at everyone else, I get really nervous. The competition at these things is always really, really impressive, but I’ve learned to stay inside my own head and not worry about other people. Just because there are some really beautiful girls at a go-see, it doesn’t mean they’ll get the job over me. The advertisers usually have a look in mind, and it’s not always about who’s the prettiest or tallest or whatever. “Thanks. Will do,” I agreed. Katie and I looked for a place to sit and wound up standing by the door, almost in the hall. I knew it would take a while though, so we slid down the wall to sit and wait. “Huh,” said Katie, grinning as she continued to stare at everyone. It was fun having her there to lighten things up and remind me how crazy this all is. Despite everything I say about not caring about modeling and whatever, I kind of do. I mean, I always want to get picked, and I do get bummed when I don’t make the cut. “Emma Taylor?” someone called, and I popped up and smoothed my hair. “Let’s do this!” I said, holding up my hand for a high five. “We’re going to kill it in there!” she said, smacking my palm enthusiastically. Book Cover Image (jpg): Emma Catwalks and Cupcakes!